Now here is an idea that surfaces from time to time. The idea of doing a sheet of just insignia. In today's market, not very many people are willing to go through the work and research to do a model of an aircraft that doesn't have a complete, ready-made decal sheet for it. However, this old salt can recall actually making his own national insignia by piling geometric shapes of various sizes atop each other to get the proper insignia. An Afghani Mig-21 done a number of years ago required 7 different decals to be placed on each other. It was a miracle that there was no silvering! 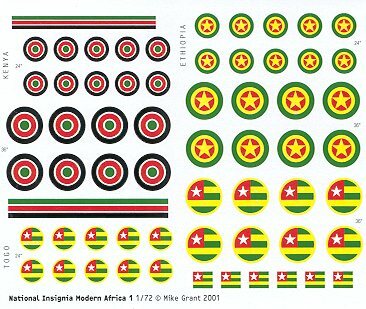 Anyway, Mike Grant has taken the plunge by offering this sheet of Modern African Insignia. You get insignia for Kenya, Togo, and Ethiopia. The registration is spot on and incredibly crisp. As you should know by now, most of Mike's decals are done on an Alps printer so have a continuous carrier. I have used Mike's decals and can tell you they are super thin and stick very well. If you like unusual aircraft and want something a bit off the beaten track, then this sheet will be a super place to start your next project. If you would like your product reviewed fairly and quickly by a site that has thousands of visitors a day, please contact me or see other details in the Note to Contributors.